Jawas were typically short natives of Tatooine. They were passionate scavengers, seeking out technology for sale or trade in the deep deserts in their huge sandcrawler transports. 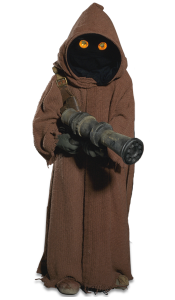 A band of Jawas was responsible for locating C-3PO and R2-D2 and selling them to Luke Skywalker’s uncle, Owen Lars. Another tribe of Jawas, led by Tteel Kkak, found Jabba the Hutt’s rancor. They had a reputation for swindling, as they had a penchant for selling old equipment such as outdated faulty droids to moisture farmers. However, they were extremely passive beings, and hardly put up any resistance to colonists of their planet unlike the other natives the Sand people, instead seeing foreigners as an excellent business opportunity. a. Black mask covering the entire face of the costumer so that no parts of the costumer’s head is visible. Face paint is not acceptable. e. Eyes should be yellow or light orange (amber), spaced for “binocular vision” and approximately 1″ – 1.25″ in diameter. c. Hood is “pointy” and must be lined with a solid, black fabric. d. Up to two bandoliers are permitted and should be worn across the chest going from the shoulder to the waist. Vest, crude, natural color, and worn over the robe. Realistic black fur may be applied to the tops of the gloves. Wretched Hive Forums Review: October 14, 2013 – October 23, 2013.